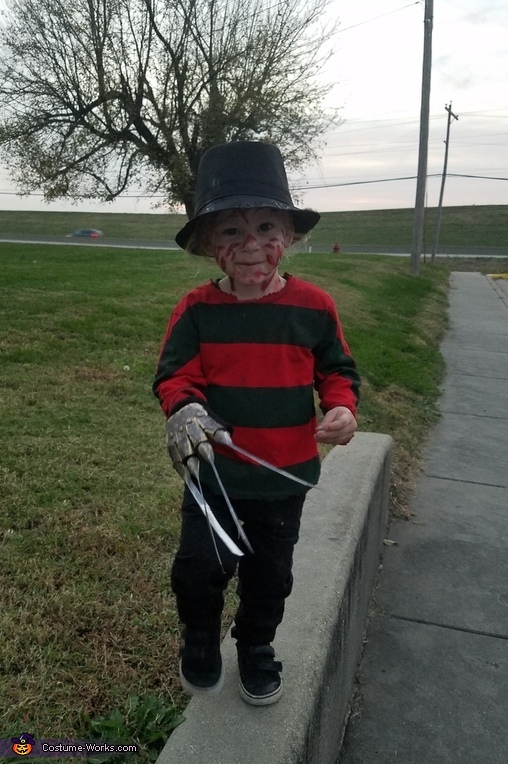 My two year old son Hunter is wearing this Freddy Kruger costume for his second Halloween this year. We recently moved and live on Elm Street this year and i instantly knew i wanted to make him Freddy for Halloween! I bought a regular black fedora hat for kids, found a plain red shirt at goodwill and used forest green fabric paint to make the stripes. He already owned black pants and shoes. I also burned all the edges of his shirt and hat for the full effect. I made his glove with a cheap baby glove, cardboard, hot glue, tabs, and spray paint. Lastly for his face and hand i used burn tattoos and went over it with shades of red lip liner. I loved making this costume and he was a huge hit ! It was so much fun.